There’s not a lot you need to know about the link between MMR and autism, except that there’s very little evidence to suggest any link at all. You don’t have to take my word for it, because I’ll describe the science later, and, if you’re interested, give you all the references you need to follow it up. But there is an interesting story here, and that is how a debate on scientific evidence became a question of personalities, and how the standard of reporting, and public understanding of science, has deteriorated to the point where Channel Five feels entitled to broadcast the poisonous and biased drama on the triple vaccine for measles, mumps and rubella you will be treated to – and it is a treat – next Monday. The only things that the writers of Hear the Silence get wrong, to be fair, are the science and the story. As a drama, it’s moving and convincing. But when you watch it, and you must, make sure you have this paper next to you. Use it as a tick chart for the half-truths, distortions and omissions. This much is true: Andrew Wakefield was a research scientist at the Royal Free who had previously published about 100 scientific papers when, in 1998, he published a paper showing that he had found traces of the measles virus in the guts of 12 children with autism. Rates of the autism diagnosis had been rising for some years (although not in tandem with increasing rates of MMR coverage). At a press conference, Wakefield suggested that MMR was dangerous and recommended the single vaccine,although with no real evidence to back this hunch. The panic began. Every other author on the paper present at the press conference endorsed MMR (as they all still do now, although work continues in the field), but you don’t see that in the drama. And Wakefield’s eyes were not dramatically opened to the so-called dangers of MMR by his laboratory finding in 1998, as portrayed in the film: he was a longstanding critic of vaccination, and previously argued that it caused Crohn’s disease. He also used to believe that the single vaccine was the more dangerous one, although then, as now, he had negligible evidence to say that either was worse. In 1998, he did not believe, as portrayed, that MMR posed a risk only to a predisposed minority of children: he was convinced that it posed a great risk to all children. It goes on. The programme suggests that the autism described in these cases was somehow unusual and new: not true. Regressive autism, where children develop normally but then deteriorate, is well known, and is described in textbooks, from well before MMR was introduced, as occurring in as many as 20% of cases. It’s also well known that some children with autism recover some language skills around the age of five, like the child in Hear the Silence: but in the drama (“it’s like he’s come back from the dead _”) they attribute it to a change in diet, an idea heartily rubbished by the scary fictional doctors. In the drama, the children in the study are described as having immune systems “in a state of collapse”: again, this is not true. Of the 12 in the study, eight had completely normal immune systems and four showed a minor abnormality of one measure of the immune system only. None was in collapse. The programme also raves on about some grand conspiracy of a big drug company to get rid of Wakefield to make more money from MMR. This is impossible, and anyone can see that by looking in the British National Formulary, online and in most bookshops. MMR is out of copyright, it’s generic, anyone can make it, you could set up a factory and make it yourself if you wanted; it’s not a money-spinner. So what do we actually know, beyond such personal opinions, about MMR and autism? Autism is a disorder of communication, so it tends to be first spotted when language develops, that is to say, about 18 months, which happens to be about the same time as the first MMR jab. Rates of autism diagnosis have been rising over the past few decades, although probably because people are using the diagnosis more, instead of other descriptors for developmental problems. Wakefield and his team found some traces of measles virus in the gut of 12 children with autism. That’s the measles virus, not MMR. This lab finding has proved extremely hard for other labs to replicate. Professor John O’Leary of Coombe Women’s Hospital in Ireland, a collaborator of Wakefield’s, seems to have replicated the finding, and might have shown that the virus was from the vaccine, but it turns out maybe not. It’s a very complex technical dispute, because it’s hard to do the laboratory studies to prove if the traces are from a vaccine or infection, and it’s not known what effect measles virus in the gut would have anyway. Either way, these are inconclusive laboratory findings on their own. And that, along with a number of understandably distressed parents, is the sum total of the case against MMR. It proves nothing about causation. It’s all circumstantial: I’m sure you could find 12 children who hate Harry Potter, or have a missing toe, and have measles virus in their gut. That would prove nothing about MMR and hating Harry Potter, or missing toes. And children were starting to talk, or not, at about 18 months, for millennia before MMR was even dreamt of. To find a small, rare effect, like a small number of kids developing autism from MMR, for example, you need to take a big sample: then you look to see whether people who are exposed to the possible risk factor, in this case MMR, are more likely to develop the adverse outcome, in this case autism. Do you believe that smoking is bad for you? Yes. Because somebody took a hundred thousand people who smoked, and a hundred thousand people who didn’t, and found that the ones who smoked tended to die younger, from heart problems and cancer. It seems intuitively right that smoking is bad for you, because it makes you cough and feel bad. But so does cross-country running, and that’s good for you. That’s why you do science, to check out hunches, because things aren’t always as they seem. So here we go, checking out our hunch on big populations. Dr Kreesten Madsen, of the Danish Epidemiology Science Centre, compared 440,000 children who had MMR with 97,000 children who didn’t. The children who had MMR were no more likely to develop autism than the children who didn’t. In Finland, one group looked at 3 million MMR vaccinations, found only 31 cases of related gut symptoms, and not one of these children went on to develop autism in the next 10 years. A group in London looked at 498 children with autism, to see if they developed it after MMR. They looked at when they had the MMR jab, and when they developed the symptoms or the diagnosis, and found no sudden blip after immunisation. Another paper shows no increase in GP consultations in the six months after immunisation. Two hundred children in London and Stafford with autism were studied to see if there was a new type of autism related to MMR, featuring bowel problems and sudden regression, a bit like in the drama: half had the jab, half didn’t, and there was no difference in type of autism between the groups. In California, looking at 1,000 children a year, over 14 years, the number of cases of autism increased by 373%, while the number of children getting MMR increased by only 14% (from 72% to 82%). There’s plenty more. It’s not perfect. Science textbooks are always being updated, and that’s a good thing. If more evidence came out to suggest that MMR caused autism, everyone would happily start changing their mind: something Wakefield has apparently failed to do in light of new evidence. There’s a huge amount of research showing no link between MMR and autism, and no new type of autism, and no effect of immunisation on bowels; and there’s very, very little to suggest a link between MMR and autism. A lab finding, in fact, which is poorly replicated. It’s a difficult thing to study, because everyone gets MMR these days, so there aren’t many people who didn’t get MMR to compare them with. And there’s clearly more work to do, as they say, accusingly, in the drama. But then, the MRC is already funding a large case-control study, among others, to investigate further. In the meantime, do you want the small risk of a small risk, or the definite risk of measles, which kills, blinds, and causes brain damage? They don’t tell you any of this in the drama. So how did we get to the point where all this evidence was washed away on a tide of hysteria? Clearly, faith in scientists and government has been deteriorating for a long time. But the devil is also in the detail. In 1998, Wakefield was an anonymous scientist. Did the story kick off when he published this paper? No. Initially, the story was the preserve of specialist reporters in the broadsheets: they were sceptical about Wakefield, and the reporting was generally balanced. Then, in February 2001, Wakefield published a new review paper, in a relatively obscure journal, questioning the safety of the immunisation programme, with no new evidence at all (although in March 2001 he did publish further laboratory work with Japanese researchers showing measles virus in the white blood cells of children with bowel problems and autism). That’s when it kicked off; although it was going to get much worse over the next year. There was more tabloid coverage, and the coverage began to suggest, incorrectly, that medical opinion was equally divided on whether MMR was safe. The journalists who wrote these stories were presumably as capable as you are of understanding the science, but they didn’t bother trying. The Daily Telegraph’s Lorraine Fraser had an exclusive interview with Wakefield, “a champion of patients who feel their fears have been ignored”, and wrote a dozen similar articles over the next year. Her reward came, astonishingly, when she was made British Press Awards Health Writer of the Year 2002. Demands for single vaccines mounted, as did the number of campaigning pressure groups. The problem with single vaccines is that they need six visits to the GP and six unpleasant jabs. “Are you saying parents don’t care enough about their children to make sure they get all their immunisations?” asked Tim Prager, the writer of Hear The Silence, angrily, when I brought this up with him. No. But it’s four more appointments to miss: maybe you’re ill, maybe you’re on holiday, maybe you move house, maybe you lose track of which ones you’ve had, maybe you can’t see the point of rubella for boys, or mumps for girls, or maybe you’re a single mother with a big family and no time. Also, children spend much more time vulnerable to infection. Especially if you wait a year between jabs, as Wakefield has recommended, out of the blue. You can see the problem. The biggest public health disaster of all was a sweet little baby called Leo. You can imagine, especially with Carole Caplin on the scene, people might believe the Blairs were the kind of family not to have their children immunised. Especially with everyone talking about “herd immunity”, and the worry that they might be immunising their child, and placing it at risk, in order that the whole population might be safer. In December 2001 the Blairs were asked the question. They refused to answer. Then it went really wrong. Here’s how. Earlier this year, the Economic and Social Research Council published a paper on the media’s role in public understanding of science. They sampled pretty much all major science media stories from January to September 2002: 10% were about MMR. MMR was also by far the most likely science story to generate letters to the press, so people were obviously engaging with the issue, and MMR was by far the most likely science topic to be written about in opinion or editorial pieces. It also generated the longest stories. In fact, it looks like MMR was the biggest, most heavily-covered science story for years. So how did 53% of the population end up believing, incorrectly, that there is equal evidence on either side of the debate? Perhaps it’s a matter of who tells the story. Pieces on GM food, or cloning, were twice as likely to be written by specialist science reporters as stories on MMR. With MMR, 80% were written by non-specialist reporters. To name a few, Nigella Lawson, Libby Purves, Suzanne Moore, and Lynda Lee-Potter have all written about their ill-informed concerns on MMR. That’s how a science story, which was based on one simple experiment, even though there was more space to explain the issue properly than any other science topic, became the most poorly covered. So what was there in all these long stories on MMR? Only a quarter mentioned Wakefield, which seems odd considering he was the cornerstone of it: but this created the erroneous belief that there was a large body of medical opinion suspicious of MMR, rather than one maverick. The tabloids almost never mentioned him, but before we grab the moral high ground, it turns out that less than a third of broadsheet reports referred to the overwhelming evidence that MMR is safe, and only 11% mentioned that MMR is regarded as safe in the 90 other countries in which it is used. Meanwhile 32% mentioned Leo Blair. But we digress. During 2002, things get really strange. In May, Wakefield “exclusively reveals” that “more than 95% of those who had the virus in their gut had MMR as their only documented exposure to measles.” But he doesn’t seem to reveal it in a peer-reviewed academic journal. It’s a tricky thing, to prove a negative, which is, after all, the key problem in the MMR disaster: but as far as I can tell he reveals this fact in a weekend colour supplement. Then in June he claims that O’Leary’s work showing some evidence of measles virus in another small sample of autistic children confirms his theory: O’Leary instantly released a statement saying it confirms nothing of the sort. People start popping up all over the place, claiming to have made some great finding, but never publish their research in proper, peer-reviewed, academic journals. A pharmacist in Sunderland called Dr Paul Shattock was reported on the Today programme and in several national newspapers to have identified a distinct subgroup of children with autism resulting from MMR. He is very active on anti-immunisation websites. But he still doesn’t seem to have got round to publishing this important work, 18 months later, even after the Medical Research Council suggested he should “publish his research and come forward to the MRC with positive proposals”. Dr Arthur Krigsman, paediatric gastrointestinal consultant at New York school of medicine, who you will see on the Channel Five debate after the drama, has been telling hearings in Washington for years that he has made all kinds of interesting findings in the bowels of autistic children. I am told you will also see Evan Harris MP, a scientist by training, rightly interrupt to stop him presenting this unpublished research. Anyway, by June 2002 we’ve pretty much got to our destination. Justine Picardie does a photo feature on Wakefield, his house, and his family, for the Daily Telegraph Saturday Magazine. Andy is, she tells us, “a handsome, glossy-haired hero to families of autistic children”. How are the family, Justine? “A likeable, lively family, the kind you would be happy to have as friends _ pitted against mysterious forces who have planted bugging devices and have stolen patients’ records in ‘apparently inexplicable’ burglaries.” Then we hit ground zero: she fantasises about a Hollywood depiction of Wakefield’s heroic struggle, with Russell Crowe playing the lead “opposite Julia Roberts as a feisty single mother fighting for justice for her child”. MMR immunisation rates have now fallen to as little as 60% in some areas, and 84% nationally. Measles cases have almost trebled in six years, and it will get worse. I don’t want to be a scaremonger, but it’s relatively easy to spot drops in uptake of vaccines that happen immediately after major scare stories, or, perhaps, a major TV drama. The drop after next Monday’s drama will contribute to measles outbreaks, and that will cause distress, disability and probably deaths. That’s not the small risk of a small risk, like MMR and autism. It’s just simple maths. The Guardian published several letters in response this which which you can read by clicking here. I applaud Ben Goldacre’s efforts to highlight how much scientific evidence is available to prove the safety of the MMR vaccine and how much damage has been done to the public’s confidence in the vaccine by poor understanding of the science behind autism (Never mind the facts, Life, December 11). The threat of a measles epidemic grows ever larger and programmes such as Channel 5’s Hear The Silence only hasten the day when that tragedy occurs. I have an autistic son and yet did not hesitate to have my daughter vaccinated with the MMR vaccine. Even if there was a slight risk with MMR, then the risk is far outweighed by the very real risk of contracting measles. As a parent agonising over the MMR booster decision, I’m prepared to consider Andrew Wakefield wrong. But Ben Goldacre seems to blame it all on the press. What influences parents to reject MMR is their personal experiences of autism and those of friends and acquaintances. This leads them to believe autism is increasing and is a serious form of brain damage. Medical establishment claims such as Goldacre’s that “autism is a disorder of communication” are seen as trivialisation, so doctors are trusted less and these personal experiences more. Claims that rising rates of autism are due to people “using the diagnosis more” are seen as a denial of the data. Goldacre symbolises the disconnect between medics and parents. His concern throughout is MMR. Parents’ concern is autism. Put aside who is right; the best way to deal with the hypothetical measles outbreak and to satisfy parents would be to find a non-MMR cause – and better still a cure – for autism. I was heartened to read Ben Goldacre’s account of the controversy and that attention was drawn to the poor quality of media coverage. Following the publication of Wakefield’s first Lancet paper, a snowball of conjecture and innuendo has lead us to a wholly unacceptable scenario today where MMR immunisation rates have now fallen to 84% nationally. For this, the tabloid (and some of the broadsheet) press must be held responsible. Their offence is clear: anecdotal and unscientific data has been given credibility by the sheer volume of coverage, while evidence-based factual results refuting the claims have been swept under the carpet. Should this be a surprise to those of us attempting to uphold the integrity of science as a respected and trusted institution, when “80% [of articles in newspapers regarding MMR] were written by non-specialist reporters” between January and September 2002. Reporting the conclusions of such non-reproducible, subjective studies is as irresponsible and dangerous to public health as any potentially rogue element in vaccines. Surely Ben Goldacre’s concerns should lie with the increasingly common practice of peer-reviewed journals such as the Lancet, in line with the current culture of evidence-based medicine, of publishing small-scale trials which may or may not later be shown to have any scientific validity. If we are to begin to encourage more accurate media reporting of scientific findings, we this is a fundamental issue. My friend and colleague, Paul Shattock, criticised by Dr Goldacre, is a pharmacist who has devoted a lifetime to the study of autism disorders and who has his own severely autistic child, now 28. Paul is pro- not anti-immunisation – but in a manner that is safe for the child. At a Defeat Autism Now conference in May, Andrew Wakefield presented a comprehensive review of all his work, which has been replicated by Dr Krigman. The science was compelling and made all the links between the MMR vaccine and the severe enterocolitis, coupled with autism, identified in some children. The dilemma for parents is: will this severe consequence of vaccination happen to my child and is there any way of avoiding it? The work at Sunderland has, much to my surprise, profound implications for a number of chronic illnesses with which I am involved, including organophosphate poisoning, Gulf war syndrome, and ME-CFS. Dr Goldacre should attend to the concern and experience of many parents. Epidemiology is no alternative to the careful study of sick children, which has been studiously avoided in this country for reasons that have never been made clear. The MMR debate will only cease when there is sufficient statistical data one way or the other. It seems that now, when some 20% of children in this country are not receiving the MMR, but have had all the other vaccinations, is a good time to make such an analysis. Autism is usually evident from 12 to 18 months, so a proportion of those who have not been immunised in the last few years will by now be diagnosed as being on the autistic spectrum. Thus a comparison between those who have had the MMR and those who have not can be made. As a grandparent with six grandchildren, only one of whom had the MMR and developed a severe form of autism, maybe as a result of it, but maybe not, I would like to know the answer. The lead letters in yesterday’s paper addressed a recent feature on the MMR vaccine written by Ben Goldacre (Fears and frustrations over MMR, page 17). Unfortunately his first name appeared as Rob (once) and his second name as Oldacre (twice). prevent getting these diseases as a grownup! and I, for one felt lucky to get it at 11.
a great source of worry for us. I know people that are deaf today because of measles. one other that I can’t remember at the moment. This was at the tail-end of the fifties. Goldacre dismissing a link between MMR and autism is as much bad science as what he’s trying to debunk. 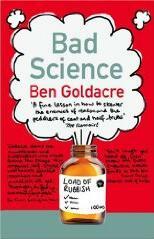 In fact, you could argue it’s much much worse, as Goldacre is a doctor, supposedly representing science. (From my experience, doctors tend to be very poor scientists). At any rate, his confusion is a classic source of bad science in itself – the factor in the link appears to be due to the use of thermerisol in vaccines. It may or may not be present in vaccines used in a particular study (MMR or any other), so combining data from different studies without regard to a possible common factor confuses the data. Further confusion has been generated by CDC and drug company sponsored “research” into links between vaccines and autism, most of which tend to dispute it. This reminds me of the French scientists who studied methyl mercaptan production in urine after eating asparagus. The study had no significant conclusion because the researchers were unable to smell the methyl mercaptan in the test, which seemed to dispute a phenomenon that’s rather well-known by lay asparagus eaters. Only years later did a much better study reveal everyone produces methyl mercaptan after eating asparagus – it’s just that there is a genetic trait that determines whether a given person can detect it. One reason people distrust scientists may be that scientists have so frequently been untrustworthy. Not, perhaps, so untrustworthy as politicians, or columnists, or “business leaders”; but none of those asserts the unbiased authority scientists do. Scientists may have a more plausible claim to it, if only because people who become scientists are more inclined to be careful about details. At the same time, however, people who become scientists are also much less comfortable than most of us with uncertainty. People who don’t feel a need to know — who don’t need to feel they know — don’t become scientists. The mores of science are rife with safeguards against temptation to bias, but they are all too easily and too often overcome. Recent history is filled with instances of major advances stalled by decades through systematic bias. (Name three? OK, just in recent biology, McClintock’s “jumping genes”, now a cornerstone of genetics; nerve cell reproduction in the human brain; weak electromagnetic fields affecting genetic expression.) It is routine that a new theory must vault hurdles far higher, to be considered or even to be examined, than the currently orthodox notion ever has done. Science, in its modern form, unfortunately reinforces every worst inclination of a scientist. Not only the grants needed to fund investigation, but the right to publish results of it, are personally controlled by those with the most to lose when their own work is supplanted. Scientists in many fields have become accustomed to entertain only minor variations of a single theory, making it impossible even to gather and present contrary evidence. Some fields are dominated by corporate interests that would be damaged by change, or revelation. Finally, political ideologists have found it appallingly easy to close off lines of inquiry uncomfortable for their supporters. Public distrust of scientific orthodoxy is well-earned. To (re-?) gain trust, and trustworthiness, will require fundamental changes in how the daily business of science is administered. Unfortunately, the trend is toward greater orthodoxy, not less. Can I just say, Eric, that it makes me feel somehow dirty having anti-MMR people posting here. I am *not* a biophysicist, but I was under the impression that thimerosal, a preservative containing mercury used in many vaccines, was under study as a possible cause of autism in children. I believe that this was the point Eric was trying to make in his comment (misspelling of the preservative noted), and that it is possible that Mr. Goldacre missed this because of the sarcastic tone of Eric’s missive. Dr. Goldacre’s equally caustic reply speaks for itself. Although unfortunate, it is a fact of medical science that tradeoffs often exist between prevention/cures and potential harm; hence the presence of disclaimers describing possible side effects accompanying every drug on the market. While autism is a devastating illness, under my own lay analysis I find the position of Mr. Carlsson most compelling. I must also admit that until reading Dr. Goldacre’s article, I was unaware that anyone was putting forth theories that the MMR vaccine itself was also a possible cause for the disease. Again, as I am not a medical expert, I am unqualified to venture an opinion on the validity of Dr. Wakefield’s claims, but the tone of what I read while preparing to write this response (articles about Wakefield containing quotes, Web sites touting his research) was reminiscent of the outcry about flouridated water. The motives behind Dr. Wakefield’s claims are unclear and could be anything from sound scientific research to mere self-aggrandizement. Mr. Myers’ arguments about the track record of researchers being influenced by outside, non-scientific forces (business leaders, political ideologues, etc.) have an air of veracity. The prevalence of orthodoxy in research Mr. Myers claims, however, and the resultant public distrust he discerns that stems from it, is where his argument fails. To repeat, I am not a medical scientist, but in my experience orthodoxy will get you a job in a research environment, but will not permit you to keep it. Careful, thorough experimentation, conducted using sound scientific practices, is the only method that will permit a career in research to continue and, under this auspice, the truth will out if the data is there to support it. One could argue that said experimentation can be guided by funding and misdirection by management but, at the end of the day, money talks. There is too much at stake, either in dollars lost by not pursuing a therapy that is later released by a competitor or by the threat of class action lawsuits for a failed therapy to permit such capriciousness as alleged by Mr. Myers to go on for long. As far as public distrust is concerned, it appears plain to me that there is a growing scientific antipathy in the United States, as evidenced by such movements as that to include “intelligent design” in biology classes, etc. My suspicion is not that lay readers carefully examine articles and become alarmed and distrustful when a whiff of ideological influence is encountered – quite the contrary. I don’t think most people read at all, and the mistrust is based in ignorance rather than analysis. To close, in my opinion as a layperson, the evidence of the benefits of preventative medicine in the form of vaccinations (or even flouride in drinking water) are too overwhelming to be denied. If risks are determined using sound scientific research, then even the most widely adopted therapies should be reconsidered and recommendations made by medical experts. Engaging in hyperbole similar to that which Dr. Goldacre accurately accuses the mainstram media of using resolves nothing and, as I believe was seen in Dr. Goldacre’s reply to Eric, clouds the issues and causes even the most qualified among us to improperly focus. For myself, I’m glad Eric posted. My experience is that medical people, in their efforts to quell (natural) suspicion of vaccines, routinely go far beyond available data. Each new study published is hailed as proof positive that vaccines are safe. In each case, when I look into the experiment actually performed, its goal and reach turn out to be very limited, the report authors’ own claims correspondingly modest. I was directed to a web site, some years ago — before my own daughter was vaccinated, and before she was diagnosed with Asperger’s — probably immunizationinfo.org. It promoted the hyperbole noted above. Furthermore, it assured us that the FDA had the authority to recall “hot batches” of vaccine, but that (because vaccines are so safe!) this authority had never been exercised. This, too, did not improve my confidence: we know there are hot batches, now and again — enough so they have a colloquial name — and they aren’t being recalled. Medical people, as a rule, feel the consequences of any public suspicion of vaccines so overwhelms any actual danger they can conceive in a vaccine that it’s worth fudging. Pediatricians avoid blaming a vaccine for bad reactions wherever possible, and avoid reporting them. A hot batch that must have sickened hundreds or thousands of children might provoke reports from only two or three doctors, and usually after it is too late for a recall to do any good. Bad reactions a week or weeks later are not reported at all. As Eric notes, the studies cited routinely ignore specific factors that might put vulnerable individuals at risk, in favor of broad generalities seemingly designed to dilute any interesting detail. Who got vaccines with thimerosol in them? Who didn’t? Who got most, who got least? Is the thimerosol evenly distributed, or does it settle in the bottle? If it settles, which are the doses that get it, the first or the last; and who were they? How much difference did it make? Which of those who give shots shake the bottle, and which don’t? I had friends whose kids have autism. I worried, and persuaded my daughter’s doctor to give her separate vaccinations, a year late and weeks apart. I thought then that modern vaccines wouldn’t have any thimerosol. I found out later that its use was just “phased out”, and that all those tainted ampules were still being shipped and used, even in 2002. I wonder now if giving her a greater number of shots exposed her to even more thimerosol, and caused or worsened her condition. Under the circumstances, suspicion was, and still is, entirely justified. Most likely, what will turn out be the actual cause is already suspected, but not being investigated at all. Few really want to know, but many fear the lawsuits that will surely follow. Suspicion of vaccines might be a tragic distraction, but the behavior of those who would reassure us does not inspire confidence. Meanwhile, the epidemic rages on. >In the meantime, do you want the small risk of a small risk, or the definite risk of measles, which kills, blinds, and causes brain damage? Unfortunately, the problem is more complex than that. For one thing the risk associated with a measles epidemic is less likely to fall on an otherwise healthy child but on a child with a weakened immune system or other disability. Further, many parents are more afraid of the monster that the media has created of autism and are frightened of the lifelong commitment to care required. The answer to this is of course for society to provide frequent and high quality respite for parents but the desperation that friends of parents of children with severe autism see enforces the impression that the condition is an intolerable burden that must be cured by any desperate attempt. Some parents would rather risk a child dying (from an external cause) than take an action which seemingly reputable people such as Wakefield allege could cause this feared condition. Fear of autism among parents and society’s intolerance of autistic people (consider the typical reaction to a screaming child at a checkout) is the real problem and, even if Wakefield is rebutted, if the problem is not dealt with by support for parents and campaigns to change society’s attitudes, other scare stories will jump up in its place. Ok, just to be up front with everyone, I am a medical student. So that means I’m definitely not an expert, but I’m not uninformed. I also know my way around PubMed and other health related internet resources. 1) I agree with people who suggest that Ben Goldacre’s article is rather too vehement in his attack on the media over the MMR issue to be taken at face value. It’s hard to take someone seriously as an unbiased scientific observer when they seem like they are emotionally involved. However, that does not mean he is wrong. He isn’t. He is absolutely right when he says that no decent studies have shown links between MMR and autism, or for that matter even between thimerosal and autism. 2) That brings me to my next point… We (humanity, not just scientists) must have standards! I know, I know — people who support Dr. Wakefield are not going to want to hear this…but there are definite established non-biased methods to critically evaluate scientific research (I won’t go into the details). We need to be able to depend upon our doctors to apply those standards when they read current research in order to sift out the rubbish from the important information. It seems to me that many people who have posted here have lost their trust in the medical profession. I’m sure they have their reasons and possibly sad stories to go with them. Some people have the time and the commitment to teach themselves about medical issues and the scientific research that is applicable to them. Some people have the time to ask questions of various different subject matter experts in order to develop their own educated viewpoint on a subject. I’m sure many parents of autistic children fall into that category. As we can tell, though, from the confusion amongst our friends and neighbours most people just don’t have the time or possiblity the ability to educate themselves. Which is why there are thousands of people who dedicate themselves to life long learning as physicians! 3) I decided to look up information on thimerosal like some of you suggested. I found a few papers in PubMed which were inconclusive on the link between the preservative and autism, but suggested more research be done on the link. I also found this interesting fact sheet from the CDC. I don’t know if it is applicable to the UK, but I think it might be. Turns out thimerosal was never in MMR jabs. Ever. I hope I didn’t offend anyone, and I’m sorry if my view is hopelessly biased in favor of physicians. I work and study with so many amazing physician research scientists that I felt compelled to make some comment, inadequate though it may be. To Debbie: Thank you for the reference. The material starting at page 147 (as numbered in the PDF; keyword “hair”) was most interesting. Someone reading less than the whole report might notice them seeming systematically to reject studies that contradict their conclusion. However, the real implication of these rejections is that not enough detailed U.S. data has been available, or studied properly, to draw the broad conclusions they offer. They have had to make do with much more limited studies, largely on populations of other countries which depend heavily on a marine diet. That said, they appear to know what they are about, and the apparently much stronger connection with maternal exposure to toxins is intriguing. The detail that MMR vaccine, on one hand, and other vaccines containing thimerosol, on the other, are parallel and independent concerns will be a surprise to many. The two have been routinely confused in popular accounts, and neither side of the popular debate has, typically, made any attempt to unconfuse them. In response to Bob’s remark, “The prevalence of orthodoxy in research Mr. Myers claims, however, and the resultant public distrust he discerns that stems from it, is where his argument fails. … at the end of the day, money talks.” Precisely my point: orthodoxy is money talking. Certainly the prevalence of orthodoxy varies widely from one field to another; it may be Bob’s good fortune or ill discernment not to have noticed any. Either way, that does not match the experience of people engaged in research, obliged to fuzz their results carefully so as not to provoke hostile interest by members of review boards, and (more usually) to concentrate on more readily-funded questions instead. It should interest almost everyone that the 1995 study demonstrating DNA damage from exposure to low levels of modulated microwaves (e.g. cell phones) has not been repeated — not for lack of interest, but for lack of funding. Those who were inclined to try have been obliged to pursue other, less disruptive lines of research instead. Bob is right, here, that the truth will out — but only in a decade or two, as industry experiments, unethically, on the population at large, rather than safely in the lab. In regard to orthodoxy Nathan – What is your opinion on Weismann’s barrier ? As for MMR I have one thing to say…..increased awareness and diagnosis rates ? Ben can we have some wholly unscientific jokes now please ? No. This off-topic speculation on thimerosal is too boring and I can’t believe I’ve accidentally given it yet another forum. I’m going to go and have a bath with the toaster. You could add thimerosal to your comment spam list 😉 Far less effort than finding an extension lead so the toaster will reach the bath. An aside: the IOM report evinced an admirable moment of doubt in observing (p. 135 on paper, or p. 150 in the PDF) that none of the studies touched on the momentary-peak exposure to the neurotoxin thimerosol. They all studied a hypothetical “cumulative” exposure, despite that thimerosol appears not, in fact, to accumulate, and that studying the total amount injected within, e.g., a 48-hour window might reveal completely different results. (More admirable would have been to qualify the summary conclusion with this well-founded doubt.) Ill-tempered misgivings aside (Ben, an autistic child of your own might help focus your attention; it did mine! ), potent neurotoxins laced into legally-obligatory treatments are worth every speck of attention we can spare. Omit known- or suspected- neurotoxins from medications, of course, and all this hair- splitting becomes academic, and I wouldn’t be here. Is Mr Goodacre *really* Dr Goodacre? If it does turn out, someday, that thimerosol didn’t ever cause autism, what assurance did you have of that before the fact, when you and your colleagues were injecting it willy-nilly into trusting infants? What assurance did you have, or will you ever have that it does not cause other, less well publicized, illnesses? At some point you must have taken the oath; what happened to, “First, do no harm”? Dr. Goldacre: Contempt is a familiar reaction, and part of the problem you claim to be upset about. Do you need a peer-reviewed survey article before you recognize it? Nathan’s really biting. Why don’t you give him a research project to keep him happy? Another one of those three page posts would be nice. Just to clarify, I feel quite strongly that these comments – on an article about media hysteria – aren’t really a place to post your theories about thimerosal or personal histories, which have been well heard. I hope that won’t be difficult for you, and I hope, in fact, I know, that you can find a lot of other places to share them some more if you want to. I’m getting a whole second wave of abusive email over this article now it’s been rediscovered on the internet, and I’ve removed a couple of the more, er, “off topic” comments. I’m perfectly okay with receiving the personal stuff if you really feel you want to send it to me, but just not to give it a public forum. Thanks. Fantastic, though it will take more than evidence for some to accept the premise that immunisation is a good thing. “Middleton said the vaccination mandates are not about children’s health. “I believe the government and big pharmacies are in bed together,” Middleton said, adding that if the state cared about children’s health it would demand “green vaccines” that do not contain neurotoxins and carcinogens such as thimerosal, formaldehyde, mercury and aluminum. Assemblywoman Charlotte Vandervalk (R District-39), the primary sponsor of the conscientious objection bill, said federal law exempts vaccine manufacturers from liability. She said the federal government compensates those parents who can establish a firm timeline between a vaccination and a resulting injury or death and has paid $910 million toward vaccination-damaged children. She said as of Oct. 1, the federal government had 988 vaccination-related deaths on file. Your near future offspring may be immune against side effects of vaccinations, due to good immune systems and other genetic traits, that are common amongst generations of well fed (naturally) individuals that skipped vaccinations, as was once in our parents time whicn vaccinations were not so religiously administered and but a few (enough to have caused havoc in the immune systems, i.e., MS, tuberculosis, allergies, leading to the Defeciency called AIDS in hunger stricken areas who have been vaccinated anyway part of the “charitable” programs of Unicef etc. In New Jersey alone autism appeared 1 tin 2000 and now it is up to 1 in some 80. Was autism not diagnosed – I doubt it! is it not a conspicous disease? I hope for your sake Ben Goldacre that yours and your wife’s forefathers were not immunised “properly” that you may bring into this world a healthy child.